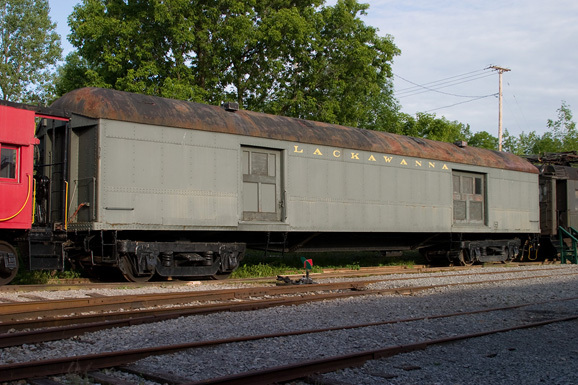 Our steel-bodied baggage car was built for the Delaware, Lackawanna & Western in 1930 by American Car & Foundry. This series of cars made up the majority of the Lackawanna’s mail and express cars right up to the end of passenger service in 1970. Cars like these were used throughout the system, from Hoboken to Buffalo, from branch line to main line. These cars would also be run through to Chicago on New York Central or Nickel Plate Road trains. As mail contracts were cut back and passenger train service was cut back, the need for these specialized cars diminished. In 1960 the Lackawanna merged with the Erie Railroad to form the Erie Lackawanna. Our former DL&W 2078 became EL 465 in 1960. Many baggage cars were reassigned to company service. Our 465 became 489022 (EL gave six-digit numbers to cars assigned to company service). Our particular car was used for storage by the Signal Department in Attica, New York. This car survived through to Conrail, and in 1985, a group of Rochester Chapter members purchased the car and donated it to our growing museum. Once it arrived at Industry in April 1985, major repairs to the roof were made. Also, one of the sliding door was repaired to allow it to move freely. The car was otherwise unaltered and was promptly outfitted as a display car. The exterior was partially backdated to its as-delivered Lackawanna paint scheme. It is our goal to repaint this car into the attractive gray with maroon stripe it wore for the later half of its career.